When looking at new countertops you’ll find an abundance of brand names, but to help make the choice simpler you should realize that there are only a handful of materials to consider. Most of these materials are pretty awesome when you compare them to the chipped and faded laminate countertops that used to occupy most Arizona homes. Corian™ is one of the most popular countertops used in Arizona homes, and for good reason. Corian™ is a solid surface that is the same all the way through, top to bottom. They’re extremely durable, but should any damage occur, Corian™ countertop repair or Corian™ countertop refinishing can generally make it as good as new. That’s the beauty of a countertop that is the same all the way through. Gouges, chips, cracks and burns all disappear through the magic of Mesa Corian™ countertop repair or Mesa Corian™ countertop refinishing. You may never need Corian™ countertop repair since these countertops are highly resistant to scratches, stains, chips and burns, although most people choose to use cutting boards and trivets rather than tempt fate. Corian™ countertops are solid and nonporous, so they also resist bacteria and mold. Corian™ countertops are made from a combination of acrylic and polyester and are sold under a variety of brand names. The variety offered accounts for much of Corian™’s popularity. They are available in literally over 100 colors, textures, finishes, shapes and patterns, along with a huge variety of edge profiles. Corian™ countertops can be made to any specification and are completely seamless. They can even seamlessly integrate a sink and backsplash is if so desired. Corian™ in any finish is very attractive, and it can also be made to resemble other materials, such as stone or concrete. Add to that the ability to last forever with Corian™ countertop refinishing. Corian™ countertops have been around for 40 years and are still a favorite among Arizona homebuilders. Their performance has been excellent and the design possibilities are limitless. Stone, tile and concrete are other common materials used for countertops. Weight is one of the biggest drawbacks to these materials. Many cabinets can’t support that much weight, and most floor joists can’t handle that kind of load without leveling and reinforcement. Other common problems with stone and concrete include; they can be hard on dishes, especially anything fragile. Stone can be scratched, burned or simply lose its sheen, and it’s not repairable. Tile requires grout, and after a short time of trying to keep tile countertops clean most people will gladly trade them in for a solid surface. Now let’s talk dollars and cents. Corian™ countertops can cost about one third the price of the others. They offer an expensive look with a reasonable price tag. In conclusion, although stone, tile and concrete are all attractive, Corian™ is the most versatile when it comes to color, shape, size and weight. No seams to coax crumbs out of either! Corian™ also reflects a great deal of light, brightening up any room its used in, while making a small room appear larger. It is a solid material that is the same all the way through, enabling it to be repaired or refinished over and over again, and it’s one of the less expensive countertop materials! What more could you ask? Richard Kaiser, the owner of AZ Countertop Repair & Refinishing has been working with Corian™ countertops for over 30 years. In addition to Corian™ countertop refinishing, AZ Countertop Repair & Refinishing can repair chips, burns, cracks and other types of damage. Whether it’s a home remodel or a large commercial renovation, Richard has the experience and ability to make your Corian™ countertop look new again. Richard follows the Christian teaching of treating others as you would like to be treated. He will always be honest with you and recommend the best option in repairing or replacing countertops. He will not overpromise and he guarantees his work. That kind of integrity can be hard to find these days. 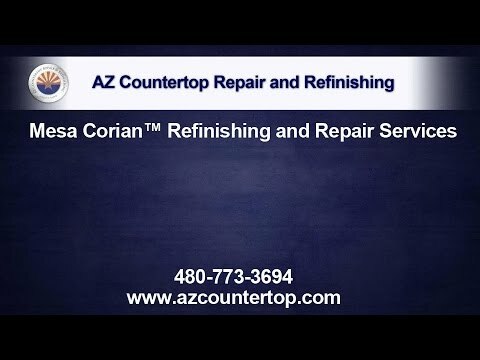 AZ Countertop Repair & Refinishing offers free estimates. They are located in Gilbert, Arizona, and serves the greater Phoenix metro area including Mesa, Gold Canyon, Apache Junction, Scottsdale and Tempe. Contact us today!